Emergency Medical Responder - EMR formly known as the First Responder is a classroom, video-based, instructor-led course from ASHI that teaches non-EMS students the knowledge and skills necessary to work as a first responder in an emergency to help sustain life, reduce pain, and minimize the consequences of injury or sudden illness until more medical help can arrive. 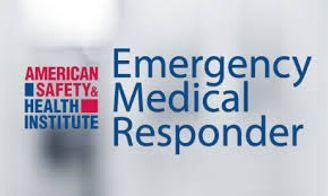 AUDIENCE: This course is for individuals who are not EMS or healthcare providers but desire certification in Emergency Medical Responder or personnel who needs a completion card in order to meet certain job, regulatory, or other requirements. COURSE FORMAT: This course is classroom-based which includes instructor, video, and skills interaction throughout the course. The course is approximately 48 hours (5 days) in length. CERTIFICATION: Upon completion of this course, students receive a ASHI Digital Certification Emergency Medical Responder completion card. If you prefer a traditional card, there is an additional $5.00 charge to the class cost. Certification cards are valid for 2 years.